The CARLTON CLOCKTOWER is located in the centre of the Piazza, making Carlton Clocktower Apartments Melbourne easy to locate and identify. LOCATION, LOCATION, LOCATION. Carlton Clocktower Apartments is situated in Australia's restaurant capital in the heart of Carlton's famous Lygon Street precinct, where cosmopolitan charm and lifestyle is evidenced by a mind blowing choice of over 300 shops, cafes and restaurants, all of which will astound and tempt all of your senses and leave long lasting impressions, which you will want to return to again and again. 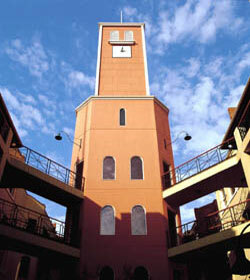 Carlton Clocktower Apartments is close to where you want to be! Located 2 city blocks from The University of Melbourne, Royal Melbourne Hospital, Royal Womens Hospital, Corpus Christi Seminary, and only 5 city blocks from RMIT, St. Vincents Hospital and The Queen Victoria Market. Additionally, within 3km, you will find Royal Park, The Victorian State Netball and Hockey Stadium, The Melbourne Zoo and The Royal Children's Hospital. Carlton Clocktower Apartments is less than 2 kilometres from Melbourne's CBD where you can find some of Melbourne's Attractions like Crown Casino, Federation Square, big department store shopping like Myer and David Jones; and only 500m from The Royal Exhibition Buildings, The Melbourne Museum, IMAX Cinema, and less than 200m to Brunetti's, La Mama, The Nova Cinema, and a major supermarket where you can pick up all of those things that you may need to make your stay with us even more enjoyable. Less than a 10 minute cab ride is Moonee Valley, home of the Cox Plate, and also Flemington Racecourse where the race that stops a nation - The Melbourne Cup - can be found. Your experience whilst staying here with us is certain to be cosmopolitan, cultural, educational and epicurian. Our Guests are offered a choice of one bedroom and two bedroom fully self contained apartments which are serviced daily (except Sundays & Public Holidays) and linen is changed twice weekly. Enjoy large, spacious modern living in our serviced apartments with plenty of room to move and relax in comfortably appointed living areas and bedrooms. All of our apartments feature a modern kitchen with a 4 burner stove, grill, oven, microwave, toaster, kettle, dishwasher, cutlery, crockery, and pots and pans. Located within each apartment is your own laundry with a washing machine and dryer. Our apartments offer Wireless Broadband through a third party provider. Our bathrooms all have separate shower cubicles and baths allowing you to relax and soak away the stresses of the day in bubbles. Rest assured all our apartments are on a smoke free basis in order to promote a pleasant environment for all our guests. For the convenience of those who smoke an ashtray can be found in your apartment for use on your balcony or terrace. A range of Breakfast Packs are available to be delivered to your apartment, and a pantry shopping service and Dry Cleaning service are also available through reception. Undercover secure parking is available, upon request (subject to availability) with a height limit of 1.9m, for a small nightly fee, but unfortunately there is only 1 car park PER apartment. Guests requiring parking MUST check in at RECEPTION first, and will then be shown where to park. Spacious serviced apartment that is suitable for up to two guests (in existing bedding)with 1 queen size bed. The apartments are serviced daily (except Sundays & Public Holidays) and linen is changed twice weekly. Carlton Clocktower Serviced Apartments offer Wireless Broadband through a third party provider, keeping you in contact with works, friends and family. Carlton Clocktower Apartments on Lygon Street in Carlton also offers two bedroom serviced apartments which are an ideal alternative to a traditional hotel room. The apartment accommodates up to four guests with a Queen size bed and 1 double bed. Our bathrooms all have separate shower cubicles and a bath allowing you to relax and soak away the stresses of the day in your bubble bath. The Carlton Clocktower Apartments' two bedroom serviced apartment is the ideal alternative to a traditional hotel room great for a family or a larger group. The apartment accommodates up to four guests with a Queen size bed and 2 single beds. A range of Breakfast Packs are available to be delivered to your apartment, and a pantry shopping service and Dry Cleaning service are also available through reception.